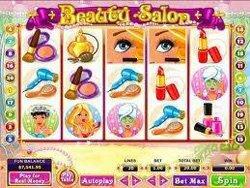 Read our review of Beauty Salon Slot which is a new exciting video slot from TopGame. It has a 3 level bonus game, wilds and scatters. Become Beautiful and win Money too! Beauty Salon is not only a brand new slots game, but an extremely fun one to play! Let me give you a few reasons why you should give it a try this instance! First of all, Beauty Salon is powered by Top Game software and it has an interesting and unique theme where you become the make-up artist for one of the girls and win extra coins while doing it. It has 5 reels and 20 paylines, along with a three-level bonus game, wilds and scatters. Besides, if you’re a passionate player and spin the most, you could win up to 20 free spins! The wagering in Beauty Salon online slots allows you to adjust the line amounts, as well as coin sizes that range from $0.01 to $5.00 per active line. And if you like winning Free Spins, then you have to get three or more Manicure Scatter symbols to appear anywhere on the five reels at the end of a game. The more Manicure Scatters, the more Free Spins are awarded! As for the Bonus Game on three levels, you can play it only after you score three or more Bonus scatters (the reddish-blonde haired Lady symbols) starting on the 1st Reel or left-most reel. When the Bonus Game activates, a new screen will appear and you’ll receive all the instructions you need to make Vicky as beautiful as possible for her hot date. But be thorough regarding her make-over, because if she likes your choice of lipstick, mascara or hair style, she will smile at you and award you with amazing bonus points! But if she doesn’t like it, she will shake her head and the game will end. Of course, all the bonus points you’ve won will be gathered at the end of the Bonus Game and then turned into a cash reward. Let’s enter together into this amazing new Beauty Salon slots game and have a blast winning as much cash as possible while helping Vickie become the beautiful young woman she wishes to be!